After sweeping the San Antonio Spurs in the regular season, the Oklahoma City Thunder might not be as confident as they should be, packing heat in the form of Kevin Durant and Russell Westbrook going into the Western conference final, because of the injury to Serge Ibaka, which will be out for the rest of the playoffs. The absence of the second best shot blocker in the NBA (2.7 in the regular season, 2.23 in the playoffs) and the team’s third leading scorer, which is the only big man the Thunder have to rely on when it comes to scoring thanks to his mid-range ability (15.1 points in the regular season, 12.2 in the playoffs), is going to make things very different on both ends of the floor, and change the thing the Thunder aren’t often credited for doing very well and solidifying their wins with. 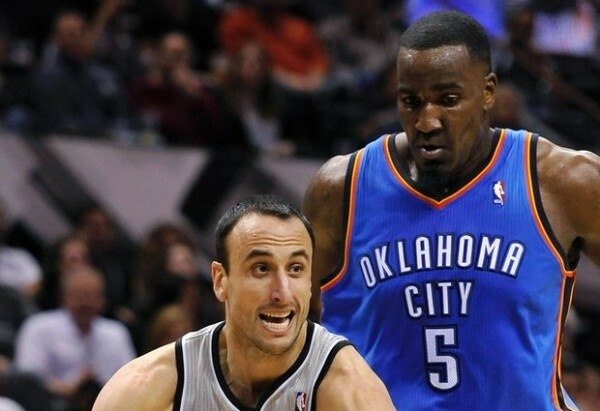 Ibaka averaged 14 points, 11.5 rebounds and 4 blocks per game in the four wins over the Spurs. He makes things a lot simpler for Durant and Westbrook in the traditional Thunder lineup, being the guy who draws someone outside the paint because it’s not a wise idea leaving him shooting jump shots without anyone disturbing him. The Spurs, who love using two guys who can guard bigs as part of their defensive system, might have caught a big break with this one. Because one of the best lineups for the Thunder includes sending Perkins to the bench and leaving Ibaka as the only big man on the floor. Going small, in a way, especially if its Durant at the power forward slot with Westbrook, Jackson and another player (Sefolosha or Butler) occupying the wing. Now, another defensive specialist and vital offensive piece is gone, which puts even more on the shoulders of Durant and Westbrook. 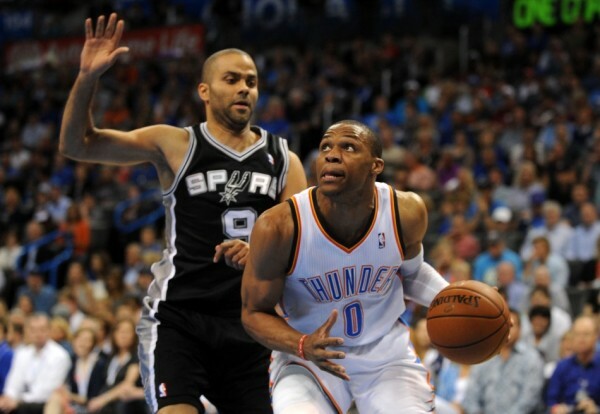 The Spurs have injury problems of their own, although Tony Parker should be healthy. His hamstring problem reappearing means that despite all the rest and Gregg Popovich smart distribution of minutes, health, age and wearing down is still an issue. The Spurs don’t depend on Tim Duncan and Manu Ginobili playing like superstars anymore, but Parker has been for the most part and especially in the series against the Blazers a driving, winning force. Home court advantage didn’t help the Spurs two years ago when the two teams met in the conference finals. The Spurs took a 2-0 lead before losing four consecutive games. James Harden showed up from the bench, the Thunder’s defense stopped being so easily beaten by the Spurs’ ball movement and Russell Westbrook started playing like a man who is focused and doesn’t let things get to him. What’s changed? Not that much. Individually, Durant and Westbrook are better players. However, without getting points from Reggie Jackson and Caron Butler even 60-70 point games from their two stars combined might not be enough. First thing to learn from what Dallas were able to do is deny the Spurs the 3-point shot. Westbrook needs to not let the screens on him in an attempt to frustrate him make him lose focus. It’s going to be a lot harder for the Thunder to clog the paint and run out to open shooters without Ibaka’s aerial support. Kawhi Leonard is a different player, and he might be the key to this series on both ends of the floor. 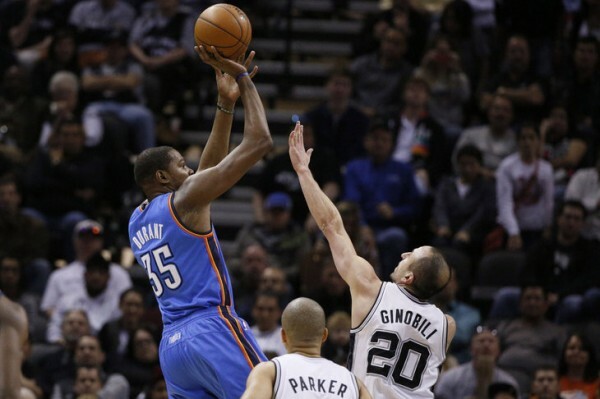 Kevin Durant isn’t completely stoppable, but he can be forced into taking bad shots. Making him get the ball from further than he is used to, pushing him around on both ends of the floor. Durant can be worn down physically, an Leonard has the physical tools to handle him, or at least make it difficult for him to get into the paint like he did in the final game against the Clippers. We’ve been hearing about the Spurs’ last chance for six years now. Maybe this one is really it. But there’s desperation among the Thunder players and especially their head coach. This doesn’t feel like a window closing, but if it doesn’t happen now, then maybe something in this impressive setup isn’t working like it should. There has to be more than just Durant and Westbrook going off for this team, and not having Ibaka is the perfect time to find out if all the moves around these two stars were worth it.